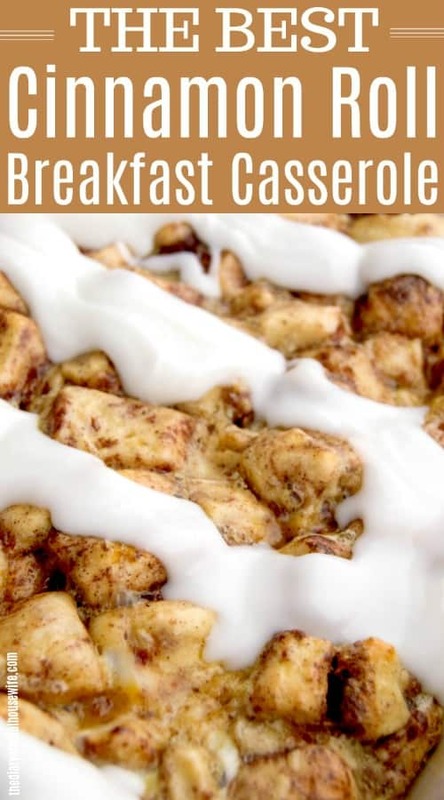 My family just loved this Cinnamon Roll Breakfast Casserole! It’s one of my favorite breakfast recipes. 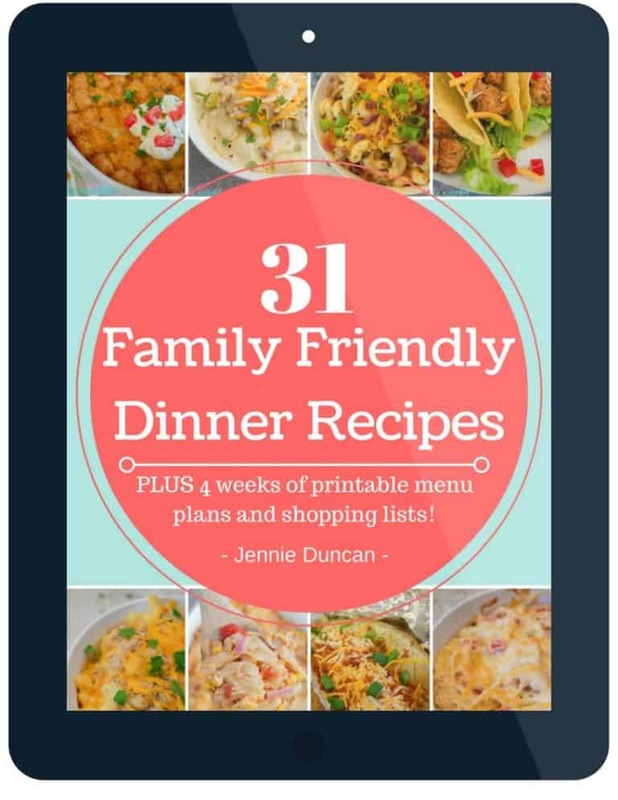 It’s super easy to make and can even be made the night before. Cinnamon rolls are a favorite at our house. What’s better than a sweet treat for breakfast, right? 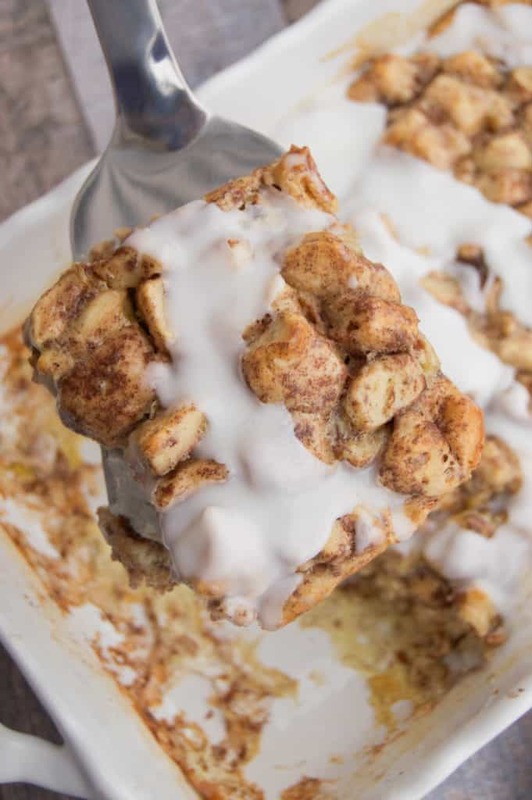 I made this Cinnamon Roll Breakfast Casserole for Christmas morning, and I think it’s the only reason my kids actually sat down for 2 minutes before ripping open all the gifts! It’s so simple to put together. I ended up prepping it the night before, and just popping it in the oven the next morning. If you love breakfast casserole then make sure to check out more of my breakfast casserole recipes next! You are going to start with two can of refrigerated cinnamon roll dough, and tear it into small pieces. Set the icing aside for after the casserole is finished, that is if you can keep from eating it plain! After your cinnamon roll is all ripped and placed in a casserole dish whisk your egg mix you are going to pour on top. I used 4 egg, cinnamon, vanilla, and heavy whipping cream in a separate bowl. Now just pour it all over your casserole! You can bake it right away or sit it in the fridge over night. I made mine the night before so I would’t have to worry about getting it together in the morning and all those flavors got to sit together all night and got the bread nice and soaked. Bake and then top it with icing. It was gone pretty fast so grab a piece quick! This is the easiest recipe to make the night before. We love serving it on Christmas morning for that reason! You just need to follow the directions and before baking cover your dish with foil and place in the fridge. Bake according to directions the next morning. In a separate bowl whisk together eggs, heavy whipping cream, vanilla, and ground cinnamon. Pour egg mixture over cinnamon rolls and bake for 25 minutes. Allow to cool slightly then drizzle on icing. Hi there! I can’t wait to share this with my family over the holiday weekend. Can I make it ahead and freeze and/or leave in the fridge? 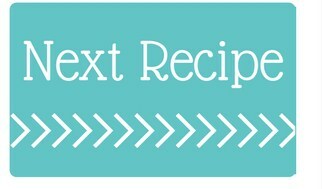 Yes this recipe is perfect for making ahead. If you want to make it just one night before you can prepare the dish and then stick it in the fridge and bake it in the morning. If you want to make it several days before and want to freeze I would follow the recipe all the way though and cook it. Allow it to cool and then freeze it. The night before you can place it in the fridge to thaw overnight and then place it in the oven for just a few minutes to warm up in the morning. Hope that helps Jordon and you all enjoy the recipe and have a wonderful weekend. Can I add walnuts to this? Thanks! Yeah! That sounds so yummy. Just chop them and add them to the egg mix and mix them in or toss them on top! 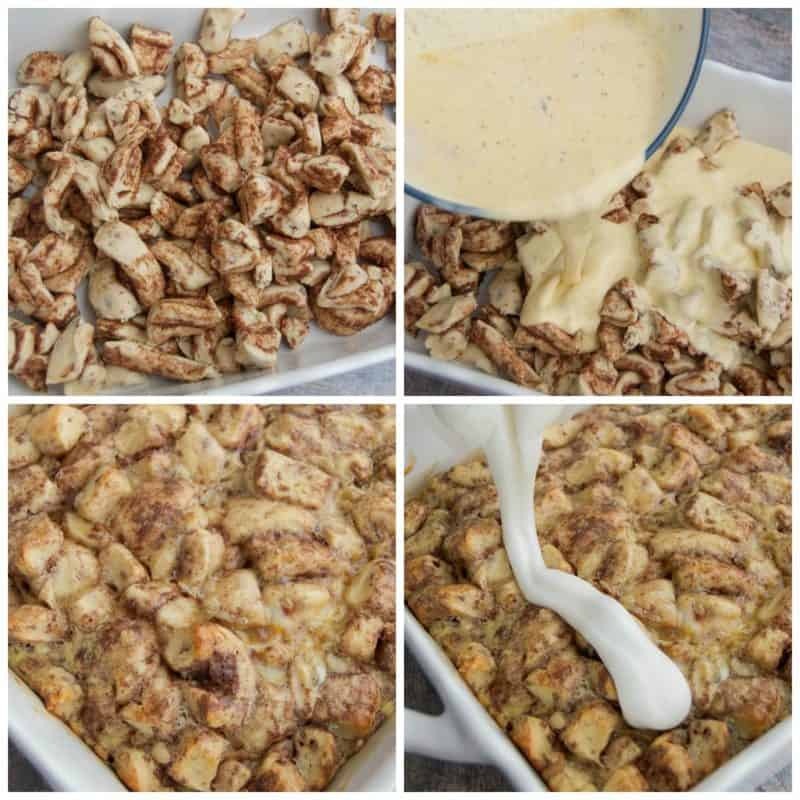 I may have to try it with Walnuts next time thats a great idea! I’m kind of a cooking/baking novice, so this may be a silly question…can I substitute half and half for the heavy cream? Thank you!!! What size pan did you use for this? 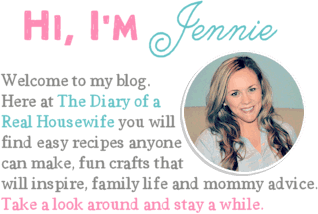 Hi Emily, a 9x9in dish would work great for this recipe.